Heat a small amount of oil in a large skillet. Sprinkle both sides of the chicken with lemon zest, garlic powder, salt and pepper. Flour the top (skin-side) of the chicken. Place the chicken skin-side down in the pan. Cook about 10 minutes or until the skin is crisp, lightly browned and much of the fat has rendered into the pan. DO NOT FLIP THE CHICKEN! Meanwhile, arrange the onions in single layer in an 8x13 inch baking pan. Drizzle with Worcestershire sauce and lemon juice. Top with the chicken, skin-side up. Bake for 30-40 minutes or until the chicken is fully cooked. Sprinkle with Parmesan and return to the oven until melted. Serve immediately. 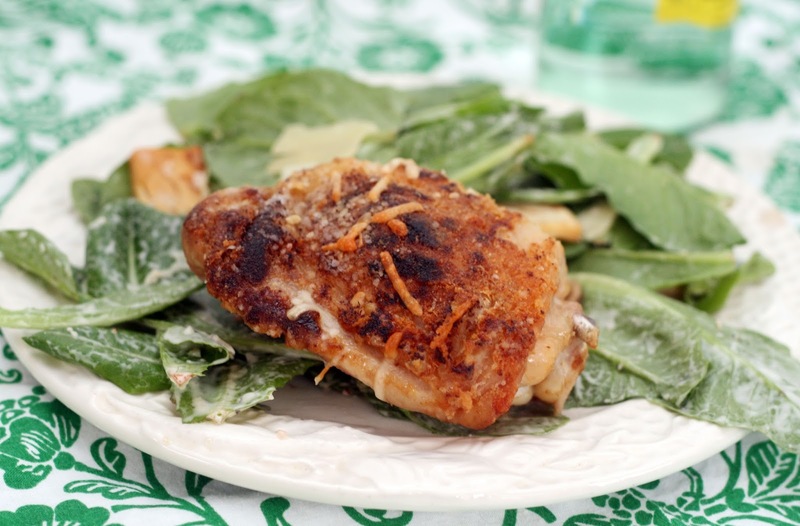 For this version of chicken thighs, I was inspired by the Caesar salad. The salad is made with lots of garlic, lemon juice and Worcestershire sauce (or anchovies), all things that go great with chicken. For the chicken I used good quality granulated garlic (not garlic powder--I like Costco brand), lemon zest and lots of freshly grated pepper and throughly caramelized the skin so it would be nice and crispy even after baking. Then I placed the chicken on a bed of onions liberally dressed with lemon juice and Worcestershire sauce. The lemon juice and Worcestershire sauce infused the chicken from beneath with the flavors I hoped for making the chicken really taste like the chicken version of Caesar salad! I then topped it with a bit of Parmesan for a bit of flair and to further tie in with the flavors of the original salad. Feel free to leave it off if you would rather, it is really more of a nod to the salad then a neccesity. I served these thighs with a Dole Organic Caesar Salad kit featuring baby Romaine, Parmesan pita chips, shaved Parmesan and Caesar dressing. This kit is a lifesaver when I am making our main meal of the day to be served at 10:30 AM in order to accommodate my husband's school schedule and is tasty. I love the baby Romaine!